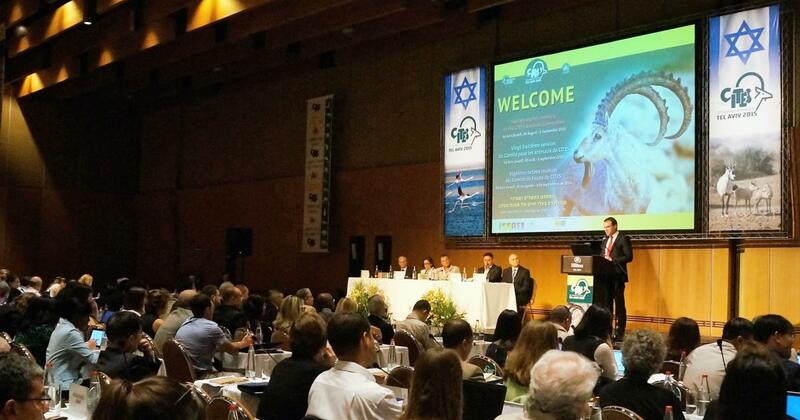 Good morning and thank you to our colleagues in the Israel Nature and Parks Authority for organizing today’s Symposium and for giving me the opportunity to address you. The question of what wildlife trade issues are addressed through international law, and the interrelationship with national law, is frequently raised by the media and members of the general public and it is a great topic for today’s Symposium. In the time available, I will touch upon some of the issues that arise most often, and in particular, I will spend some time on law enforcement, as it is a topic that generates a lot of discussion. The need for a convention to regulate international wildlife trade was first identified in a decision of the IUCN General Assembly held in Nairobi back in 1963. The 1972 UN Conference on the Human Environment, held in Stockholm, called for negotiations on a convention to be concluded as soon as possible and the US Government heeded this call by hosting a Plenipotentiary Conference in 1973, which resulted in CITES being adopted on 3 March.3 Today CITES has 181 States Parties4 and it is regarded as one of the most successful of all international environment-related agreements, noting that CITES is increasingly being recognized in the context of sustainable development, as I explain below. This outcome has reinforced the links between CITES implementation and sustainable development, which has taken on even greater significance with the UN General Assembly adopting the first specific resolution on Tackling Illicit Wildlife Trafficking last month and with UNGA being poised to adopt the Sustainable Development Goals in September of this year. CITES implementation will contribute in many ways to achieving these Goals and related targets. There are over 15,000,000 recorded authorized trade transactions in the CITES trade data base. Legal and sustainable trade can have benefits for both wildlife and people, which has been formally recognized by CITES.15 The recovery of the vicuña in South America is one such example of where local people and wildlife have benefited from well-regulated trade. CITES continually reviews the levels of international trade in CITES-listed species through its Review of Significant Trade.16 This is conducted by the CITES Animals and Plants Committees, which can ask exporting Parties questions about the levels of trade, including about their non-detriment finding, and make recommendations to the Party. If recommendations are not adequately implemented, the Standing Committee can take compliance measures,17 which can, as a last resort, result in a recommendation to suspend trade in the affected species. As mentioned above, CITES recognizes the potential positive and negative impacts CITES can have on livelihoods. Legal and sustainable trade can have benefits for both wildlife and people, as has been referred to, but listings may also have negative impacts on livelihoods. CITES recognizes these issues and several CITES resolutions and decisions are focused on identifying such impacts and mitigating any negative impacts.18 This recognition is however in the context of implementing decisions to list species under CITES, rather than in considering a decision on whether to list a species or not. The animal welfare provisions under CITES are specific and targeted. They address the transport of live animals so as to minimize the risk of injury, damage to heath or cruel treatment and ensure the suitability of places destined to receive live animals23, including rescue centers. Guidance on meeting these CITES obligations have been provided by the Parties in some instances, such as through the guidelines on the transport of live specimens24 . However, to date, States have considered that most animal welfare issues should be addressed through domestic law rather than international law and there is currently no global treaty governing either animal welfare or animal rights, although efforts have been made by some NGOs in this regard.25 It is perhaps partly for this reason that CITES has been used as a forum for the expression of a wide range of differing and passionately held views on international trade in wild animals, including on particular trade transactions, whether all of the actions sought by various actors fall under the current mandate of CITES or not. This message was powerfully reinforced earlier last month when the UN General Assembly unanimously adopted a resolution on ‘Tackling Illicit Trafficking in Wildlife’, being the first dedicated resolution on the topic adopted by the UNGA. This resolution was the culmination of several years of increasing political attention being paid to the devastating impacts of illegal trade in wildlife. These resolutions, and those taken by CITES and others, recognize that illicit wildlife trafficking increasingly involves transnational organized crime and in some cases rebel militia and rouge elements of the military. This has changed the dynamics of combating this highly destructive criminal activity, in particular as it relates to some charismatic species, such as elephants and rhinos. As a result, the importance of treating certain illicit wildlife trafficking as a serious crime27 has been recognized by the UN General Assembly and others along with the need to combat corruption. The need for States to engage with Customs, the police, rangers or inspectors, the judiciary, and sometimes the military to implement CITES effectively is also recognized, which may necessitate intervention from the highest political level. And great strides were made in this direction when five key intergovernmental agencies dealing with wildlife crime formed a new alliance in 2010 called the International Consortium on Combating Wildlife Crime 29 (ICCWC) – an initiative that is providing coordinated support and technical assistance to countries, including on the use of sophisticated investigative and anti-money laundering techniques, the sharing of intelligence and modern forensics. We have also seen the United Nations Security Council adopt two Resolutions on UN sanctions targeting armed groups in the Central African Republic and the Democratic Republic of the Congo30 financed by the illegal exploitation of natural resources, including poaching and illicit wildlife trade. Individuals or entities involved will be subject to travel bans and asset freezes. Such measures are critical when dealing with States where there is a breakdown in law and order and where armed groups are operating. Some academics and non-governmental organizations have called for international enforcement powers to combat illicit wildlife trafficking.31 This could only occur under the existing international legal regime if the jurisdiction of the International Criminal Court were expanded to cover illicit wildlife trafficking. To do so, such offences would, however, need to be regarded by the international community as one of “the most serious crimes of concern to the international community as a whole”, such as the crime of genocide32, and included in the Rome Statute of the International Criminal Court. It is highly unlikely that such a step will be taken, at least in the foreseeable future. In this our 40th year of being in force,33 CITES is seen as a great example of successful international cooperation combined with national action that has evolved to meet new challenges and will continue to do so. 1 And a few species-specific agreements that are also relevant, such as the Fur Seal Convention and the International Convention for the Regulation of Whaling. 2 This remains the case with species that are not CITES-listed and therefore many States have increasingly turned to CITES to assist them in regulating international trade in high value timber. 3 The US government’s own figures on imports into the US in 1969, figures that were openly shared at the Plenipotentiary Conference, are nothing short of staggering. They included the import of just under 8,000 leopard skins, close to 1 million live birds and over 1.4 million live reptiles. These numbers pale in comparison with the import of almost 99 million live fish. 4 States – as distinguished from individual ministries – become Parties to a convention, and it is the State, through its executive, legislative and judicial bodies, that takes the measures that are necessary to implement a convention. In the case of CITES, Parties are obliged to establish at least one Management Authority and one Scientific Authority to carry out functions relating to the determination of legal acquisition and biological sustainability, the issuance of appropriate CITES permits and certificates, the enforcement of relevant laws (in cooperation with general and specialized enforcement authorities) and the submission of periodic national reports. 6 See CITES Strategic Vision 2008-2020. 13 For example through ICCWC (the International Consortium on Combating Wildlife Crime). 19 While there are many definitions, perhaps the primary distinction between the two is that animal welfare accepts the responsible use of animals to satisfy certain human needs, whereas animal rights does not, with animals themselves having rights that must be respected. 21 The World Animal Health Organization (OIE) established an Animal Welfare Working Group in 2002, which has adopted a number of non-binding animal welfare standards. 22 The Convention on Migratory Species and the International Whaling Commission. 24 See Resol. Conf. 10.21 (Rev. Cop16) Transport of live animals, which recommends Parties promote the full and effective use by Management Authorities of the IATA Live Animals Regulations (for animals), the IATA Perishable Cargo Regulations (for plants) and the CITES guidelines for the non-air transport of live wild animals and plants. 25 For a summary see for example Georgetown Law Library website dedicated webpage on the topic. 27 As defined in the UN Convention against Transnational Organized Crime. 28 This is already the case with INTERPOL, the UN Office on Drugs and Crime, the World Bank and the World Customs Organization, as well as the UN Commission on Crime Prevention and Criminal Justice. 29 The CITES Secretariat, INTERPOL, UNODC, the World Bank and World Customs Organisation. 31 There is some academic debate on whether a crime of ecocide should be included.